I love these buttonholes, as they can be used on the fussiest of fabrics – from a loosely woven tweed to a fragile silk – in a variety of sizes. I thought I’d post some instructions of how to do them. 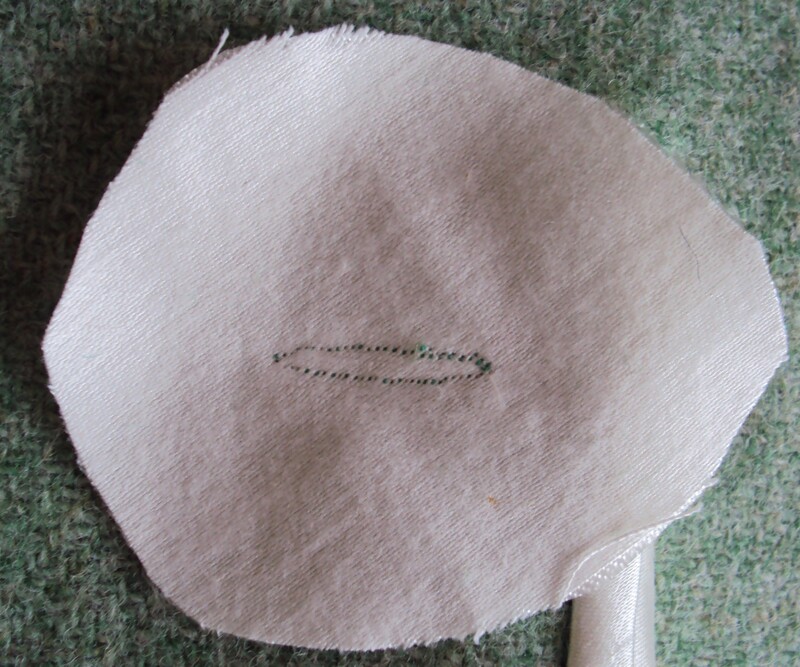 CUT egg-shaped piece in the fabric you are using for the binding of the buttonholes. 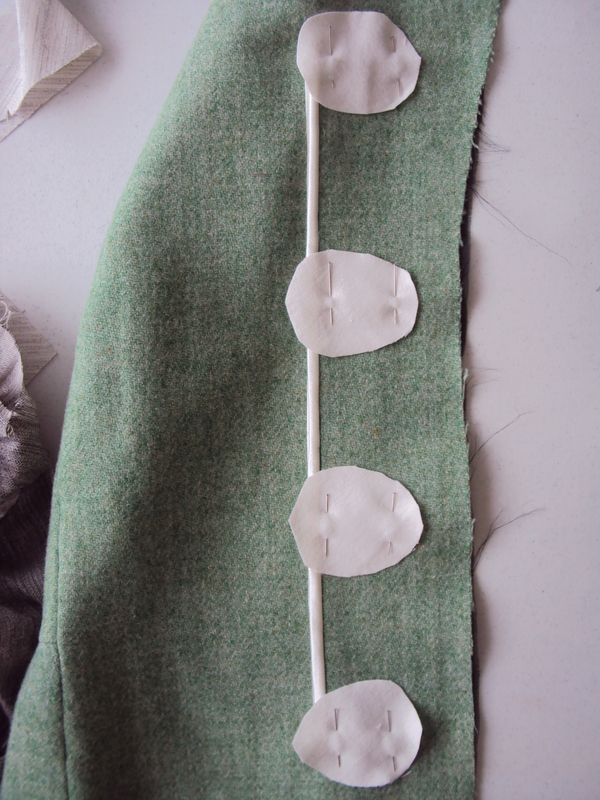 In this example, I used the lining fabric for the coat. You can use a lining fabric, silk organza or any other tightly woven fabric. 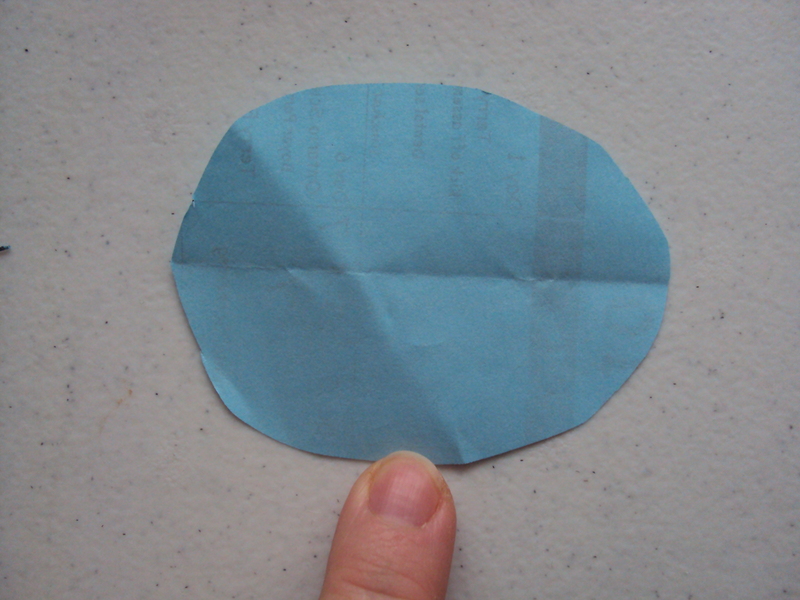 Make a paper template of the egg shape and mark the centre lengthwise. The template needs to be 3″ long by 2″ wide. 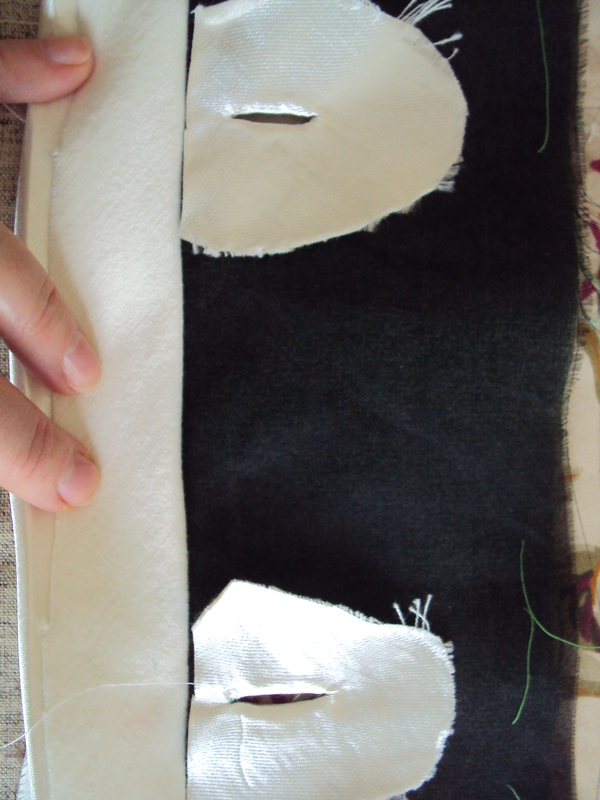 Each piece of buttonhole facing must be cut on the true bias. This is very important. The centre lengthwise marking on the template must be on the true bias of the facing fabric. MARK your buttonholes on the wrong side of the fabric. ON RIGHT SIDE of front, centre buttonhole facings over the marked buttonholes and pin into place, right sides of fabric together. STITCH in a football shape, 1/8″ seam width, tapering to the ends of the marked buttonholes. Stitches must be 1.4 or less in length (or very tiny, in plain English). The shape must be a football shape – not to narrow and not tapering too suddenly to the ends of the buttonhole. PRESS to set the stitching. 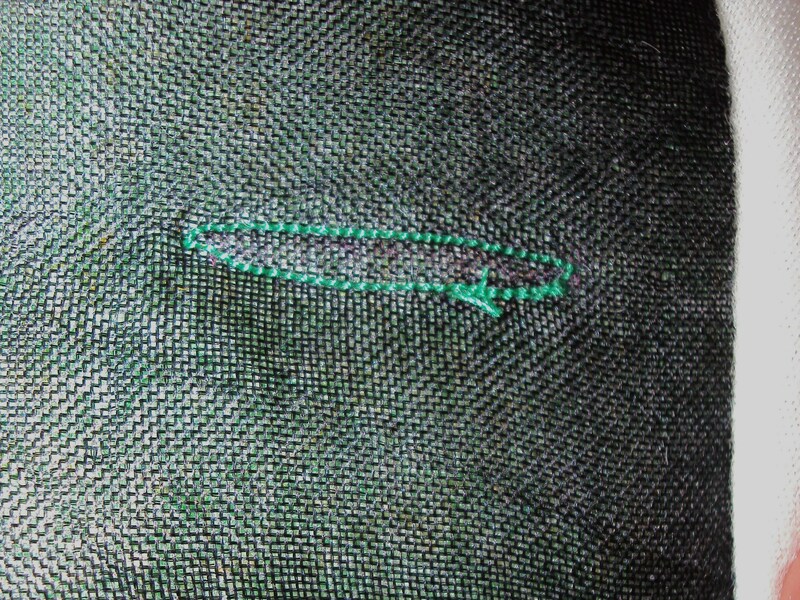 MARK the ends of the buttonhole stitching with a pin and slash very very VERY carefully. Do not cut through the stitching. The pins will prevent clipping into the stitching. PULL the buttonhole facing through to the wrong side and pull taut quickly (hence the “snap”). 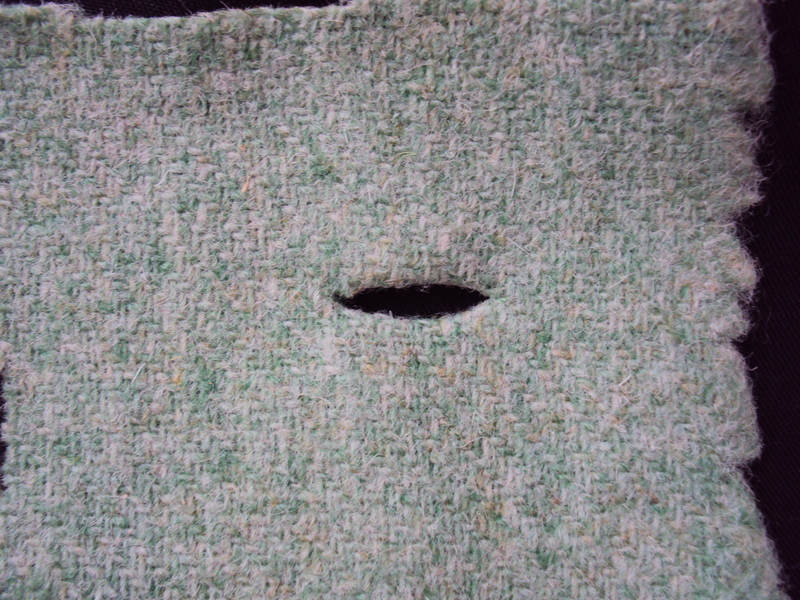 TRIM the buttonhole facings at the front edge of the garment if necessary. FINISH the facings of the buttonholes as you would for a bound buttonhole. I did not do this for the examples posted here, as they are part of the hidden button closure on BurdaStyle 09-2010-101. See how nicely these buttonholes finish up? I find them less fussy than a traditional bound buttonhole, especially for tweeds and such. 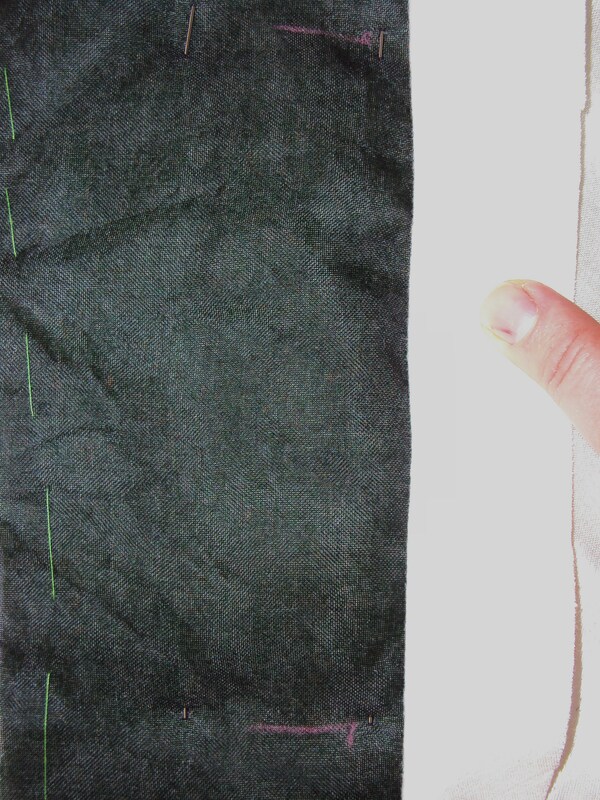 Always make a sample (or two or three) until you are sure of the technique before actually doing one on your garment. This is something I’ve never seen before. I hope you will show us a picture of the whole coat with the button holes later. It’s great to learn new techniques. I think this button hole would look very modern and minimalist. Mad for Mod – 60's fashionista!